← If you like Wolf Creek, Hostel, or Wrong Turn, you’ll probably like…. 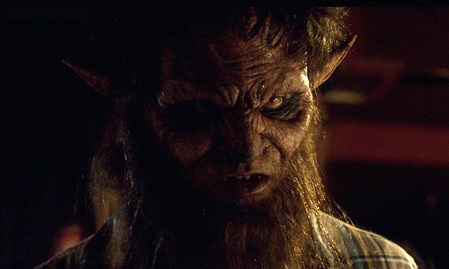 In the tradition of Creepshow and Tales from the Darkside, Tom Holland’s Twisted Tales consists of nine short films that were part of a FearNet series and have been compiled into a movie that runs over 2 hours long. The only thread holding them together is that Tom Holland, director or movies such as Fright Night (original), Child’s Play, Psycho II, and Thinner, introduces each episode—and basically gives away the entire plot of the story in like one sentence. Episodes range in time from 7 to 30 minutes, feature plenty of iconic horror faces, and are generally a bit campy in tone. They also probably would have been rejected as Tales from the Crypt episodes. There’s just not much punch to these stories and none of them is very memorable. I’ll give a brief rundown of each episode and try not to spoil them like Tom does in his intros. Indie horror cutie A.J. Bowen confesses to his GPS that he killed his wife…and his GPS starts talking back to him. This one is very campy. Danielle Harris is a woman scorned, so she plays with hellfire to get revenge on her man. This is one of my favorite episodes. A guy is paranoid his friend is screwing his wife so he attaches them both to bombs. There’s a fun little twist in this one. A young magician and his assistant go to meet a master magician, played by Ray Wise, who has an incredible magic mirror that truly can transport people to another world. I like this one just because of the cool, flesh-eating beasts that are unleashed when a bunch of kids tries a new drug that is supposed to make you a seer. Angela Bettis, Amber “Buffy lesbian Tara” Benson, and poor man’s Keanu Reeves James DuVal star in this film about friends who start turning on each other at a dinner party when the news reports that the world is pretty much coming to an end. A killer iPad? Indeed, it seems those who get their hands on one particular tablet are then killed by it. Very campy and the longest episode, this one is about a girl who does a magic ritual to ward off the devil…and then thinks the devil has come knocking on her door disguised as a goofy pizza delivery boy. This final short is over before it begins. All I know is that there are vampires at a club. 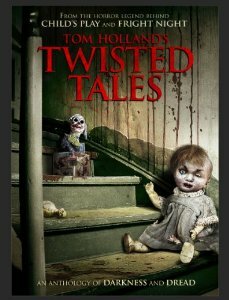 This entry was posted in Movie Times & Television Schedules - Staying Entertained, The Evil of the Thriller - Everything Horror and tagged horror anthologies, Tom Holland’s Twisted Tales. Bookmark the permalink.